Matt Biondi is one of the most decorated men in Olympic history, with 8 Olympic gold medals, and 11 overall, at the sport’s biggest event. In the summer of 1988 in Barcelona, Biondi had one of the most incredible individual performances ever seen by a sprinter, winning 5 gold medals and breaking 4 World Records in the process. But it wasn’t a perfect week for him. On the 4th day of the meet, in the 100 butterfly, he came to the wire stroke-for-stroke with Anthony Nesty. Biondi’s final stroke left him long, and he kicked into the finish, which cost him a gold medal by exactly .01 seconds. He didn’t let that get him down or wreck his spirits. He came back the next day in the 100 free to take a dominant win and break the Olympic Record. That’s what made Biondi one of the best: his constant drive to be better. If he lost one race, everybody knew to get out of his way in the next one. Swimming in the sprints – the glamor events of the era – Biondi brought a blue-collar work ethic to the pool every day. That dedication and constant push to be better is what put him always on the leading edge of the sport. 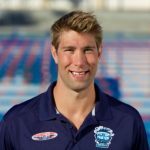 In 1988, he was the first-ever Olympic Champion in the 50 free, he was the first man to break 49 seconds in the 100 free, and it was nearly a decade before anybody else could catch up to his record-breaking pace. Perhaps the most telling is the fact that he is one of only two men in history to win medals in the 50, 100, and 200 freestyles in the same Olympics. Biondi was also a member of the US National water polo team in between the 1988 and 1992 Olympics, and he toured with them for two years. 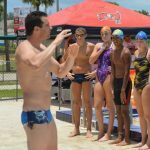 At the 2014 USMS National Championships, Biondi competed in his first meet since retirement and once again electrified the swimming world. 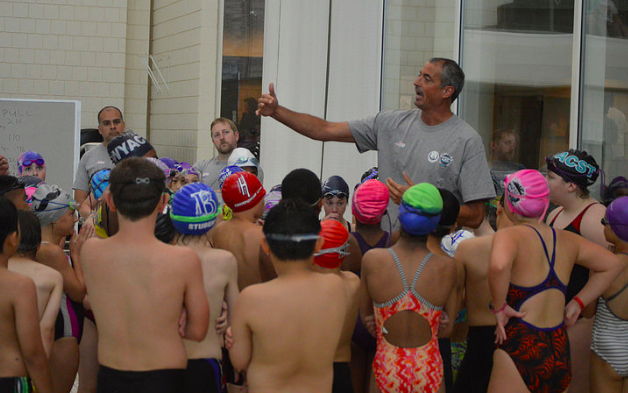 He continues to pour out into the sport by conducting clinics around the country. 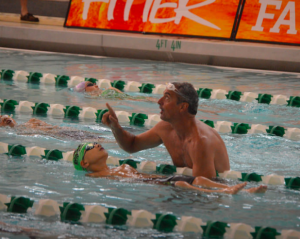 Book Matt for your next Fitter and Faster clinic!